Do you like going to the zoo? Actually, have you ever been to a zoo? In today’s society, the zoo is quickly becoming an extinct part of life. Gone are the days where the zoo used to be a fun place to hang out and find out about animals and wildlife. It’s really sad. Don’t let this happen to you. Be a model for someone else and share the beauty of knowing firsthand about animals that we have on the Earth. 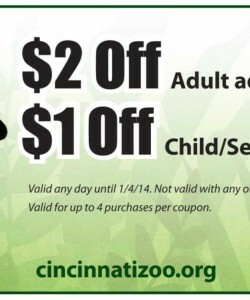 You can do just that when you use this CINCINNATI ZOO DISCOUNT ADMISSION COUPON. You can have $2 off an adult admission, and $1 off a child/senior citizen admission. This is wonderful, because as with everything else, you will find that it can get very expensive going to the zoo. Zoos are usually very large open spaces, so you can make an entire day of it! There is also food to eat and other attractions that can give you insight into how the animal world lives. It’s definitely an experience you should have in your life. Unfortunately, funding for the zoo is usually cut time and time again so it’s crucial to preserve this type of event for children. With this coupon, you can have up to 4 people on your trip so make a day of it. Grab your friends or your family and head on out to see the penguins, lions, tigers, bears, parrots and other species that you may not even have heard about – ever. Learning about animals hasn’t been very high on the curriculum in schools as of late. Take matters into your own hands and get down to the zoo today. The fall is here and it will be cold soon. Don’t miss it!